You may have noticed on the availability schedule that the Terrace room is blocked off for the next two weeks. That’s because we’ll be doing some painting. Serious painting. Currently, the wall color is what one guest has described as billiard table green. Although it’s not a bad color, it’s not really our earthy style. So we’re kicking up the color a notch and creating a two-tone room, with a copper-colored fireplace as one of the focal points. The fireplace (currently white) goes from floor to vaulted ceiling so the added color should make a big difference in how you see the room. The existing bathroom tile is blue, and we like it, so we’ll continue the copper color into the bathroom for one of the walls to create a little warm contrast. We may even put the copper tone in the Terrace’s hot tub room (until we get the mountain mural done that we’ve been visualizing for the past six months…). Colors are below. Wall colors are River Sand and River Mud. 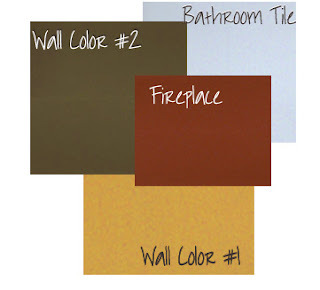 Fireplace and bathroom wall color is Copper Mine. The wall colors scanned a bit darker than the actual swatches. All paint is by Behr and can be bought at The Home Depot.